WEST DES MOINES, Iowa, Feb. 13, 2019 /PRNewswire/ -- Businessolver®, a leader in SaaS-based benefits administration technology and services, completed 2018, the company's twentieth year in business, in a healthy state. 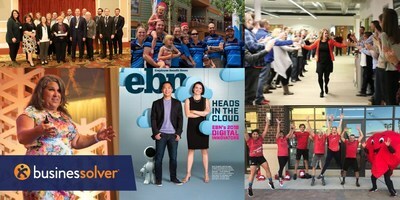 Driven by award-winning technology innovations, integrated benefits services, key new hires, and strategic office openings and expansions, Businessolver continued its intentional growth strategy with strong momentum heading into 2019. "The benefits landscape continues to evolve to meet consumer needs. Our organization has consistently remained nimble so that we can pivot quickly to create the right technologies at the right time when our clients and their employees need them most," said Businessolver President and CEO Jon Shanahan. "Our 20th anniversary year was momentous — filled with innovation, new voices and expertise, regional growth, and industry acknowledgments. I'm proud of how our teams fuel our continued success, and how we will continue to raise the bar in 2019." Through strategic partnerships, market expansions, industry-leading product innovations, and continued investment in deep benefits expertise, the company maintained its long-term client retention rate of approximately 95%. In 2018 Warburg Pincus, a global private equity firm with over $46 billion of capital under management, made an investment in Businessolver and will expand Businessolver's strategic initiatives, governance and oversight. Warburg Pincus and the Businessolver executive team have already begun partnering together to accelerate Businessolver's focus on technology innovation and providing its customers with leading products and services. "We are pleased to have the support of Warburg Pincus as we implement the next phase of our growth strategy and pursue new opportunities to disrupt the benefits technology market," said Jon Shanahan, President and CEO of Businessolver. "Benefits administration is becoming increasingly complex in today's market, and our flexible SaaS offering helps companies make this process easier for their employees. Hundreds of blue-chip clients have come to rely on our leading technology solutions and commitment to customer service to effectively manage their benefits needs, and we look forward to pursuing new growth initiatives with this investment." "Businessolver has established itself as a market-leading platform in the benefits administration market, where more enterprises are adopting SaaS-based solutions to manage their employee benefits programs in an accessible and cost-efficient way," said Alex Berzofsky, Managing Director, Warburg Pincus. "We look forward to partnering with Jon and Businessolver's strong management team to further advance the company's products and services, as well as to continue expanding their large enterprise customer base, which has grown rapidly in recent years." Strong performance led to key office expansions across the United States. In July, Businessolver opened a Louisville-area office dedicated to their expanded consumer accounts administration services in order to provide the most seamless and effective solutions to clients. The company also opened their Dallas-based office in August focusing on client support, sales, and professional services. Finally, after opening the office in 2016, Businessolver's Charlotte office doubled in size to support the continued growth in our east coast-based clients. Businessolver's commitment to improving performance and business results was recognized by their earning Bronze Level Recognition by the Baldrige Excellence Framework. For the second year in a row, Businessolver was honored by the Iowa Recognition for Performance Excellence (IRPE) and is the only benefits administration company, and the first technology company in the U.S., participating in the Baldrige journey. Enhancing the platform to be compliant with applicable Section 508 V2 and Web Content Accessibility Guidelines (WCAG) 2.0 A and AA guidelines. Assistive devices such as screen readers and special keyboards can now navigate the platform and those with cognitive disabilities have more time to make their benefits selections. Integrating instant dependent verification into the Benefitsolver platform by leveraging Businessolver's AI and machine learning technology to approve dependents in seconds, thus improving file accuracy, reducing human error, minimizing the retroactive deduction process, and providing members with peace of mind protections for their loved ones. Revamping the interface of the MyChoiceSM Recommendation Engine, increasing the education and flexibility for users to make the right benefits decisions that fit their needs. Collaborating with Transamerica, a leading provider of insurance, retirement, and investment solutions, to offer members an industry-first, integrated enrollment in retirement plans alongside employer-provided medical and voluntary benefits for a holistic view of their overall wealth and health. In addition to their flagship platform updates, Businessolver continued to develop its industry-first, machine learning personal benefits assistant, Sofia, who can now answer questions about more than 130 benefits topics in 20 languages. In 2018, Sofia was developed to understand voice recognition and how to manage workflows to take on tasks at the employee's request. Human Resource Executive® recognized Sofia as a Top HR Product of 2018 and Sofia's creator, Businessolver's Head of Applied Data Science, Sony Sung-Chu, was recognized as one of Employee Benefit News's Top 2018 HR Technology Innovators. During the 2019 Annual Enrollment period, Sofia continued to show her strengths by handling more than 51,000 chats in two months and resolving more the 57 percent of Businessolver's total chat volume. "AI and technological growth have fundamentally changed HR, and will continue to do so," said Businessolver Chief Strategy Officer Rae Shanahan. "We're proud to be trailblazers in industry-leading solutions for HR professionals, the first to deliver AI for benefits service, just as we've been since our founding." In 2018 Businessolver continued its annual Vision Tour, a series of client events for HR and benefits professionals to exchange ideas, share best practices, and learn about new HR technology innovations. Hosted in San Francisco, Philadelphia, and Chicago, Vision 20/18 featured an exclusive half-day training program from award-winning leadership and workforce development expert, Cy Wakeman, on Wakeman's own no-drama, reality-based leadership approach. In 2018, as part of their own leadership and development training, the Businessolver organization completed more than 14,000 hours of Wakeman's reality-based curriculum — virtually and in the classroom — throughout all levels of the organization. The training program equipped Businessolver employees to be better leaders of people and projects and ensure that the entire organization is committed to being responsive, responsible, and accountable to clients and employees. To showcase some of Businessolver's best insights from internal and external partners, Businessolver's SVP of Employee Engagement, Marcy Klipfel, was accepted into the Forbes Human Resources Council, giving her a platform to share her expertise and experience with HR executives across all industries. 2018 was also the year Businessolver released its third annual State of Workplace Empathy Study to continue to help employees, HR professionals, and CEOs understand the value and impact empathy has on workplace culture, innovation, productivity, and profit. Businessolver also launched the Businessolver Empathy Index, a first-of-its-kind, online assessment tool for companies to evaluate and measure empathy in their organization, and gain actionable insights into where more empathetic practices are needed. One of the ways Businessolver creates their own empathetic workplace culture is by valuing emotional and physical wellness. This value was recognized by the American Heart Association (AHA) for a Silver Level Workplace Health Achievement award in recognition for the company's continued dedication to health and wellness. This year Businessolver exemplified its core value of "Giving Back" through its three pillars of giving: Health, Education and Community. In 2018, the Businessolver Foundation donated more than $300,000 to a variety of causes and communities. Employees contributed an additional $27,000 and volunteered more than 2,500 hours in total throughout the year. Since its inception in 2016, the Businessolver Foundation has donated over $730,000, including more than $62,000 from employees, and over 4,000 hours of their time. This year's donations and volunteer support went to organizations including the Los Angeles Fire Department Foundation, Make-a-Wish Foundation, Habitat for Humanity, Junior Achievement, Ronald McDonald House Charities, National Ovarian Cancer Coalition (NOCC), Greater Baltimore Medical Center (GBMC), and RAGBRAI (Register's Annual Great Bicycle Ride Across Iowa). "Our Businessolver Foundation efforts and initiatives directly impact and improve the health, education and communities in which we live and work," says Jon Shanahan, President and CEO of Businessolver. "Our Foundation Manager and employees have done an incredible job identifying people and communities in need, and taken action to donate funds, provide support, and invest their time to make a difference in peoples' lives." Warburg Pincus LLC is a leading global private equity firm focused on growth investing. The firm has more than $46 billion in private equity assets under management. The firm's active portfolio of more than 170 companies is highly diversified by stage, sector, and geography. Warburg Pincus is an experienced partner to management teams seeking to build durable companies with sustainable value. The firm has been a leading investor in SaaS companies, with current investments including Avalara, CrowdStrike, DocuTAP, Dude Solutions, Duetto, Liaison International, Modernizing Medicine, NEOGOV, PayScale, and Procare Software, among others. Warburg Pincus is an experienced partner to management teams seeking to build durable companies with sustainable value. Founded in 1966, Warburg Pincus has raised 17 private equity funds which have invested more than $72 billion in over 845 companies in more than 40 countries. For more information please visit www.warburgpincus.com.